Colin Thornton struck an unbeaten century for Bomarsund first team but his side still went down by six wickets against Whitley Bay at West Park. The skipper led the way with a superb knock while Stephen Thain (37) provided support as the visitors recorded 224-5 from their 50 overs. But Thornton felt his bowlers did not put the ball in the right areas as Ivan Pearson (66) set the hosts on their way, and Craig Sample (68) took Bay over the line with overs to spare. 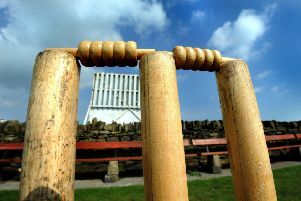 After a heavy defeat to Stobswood Welfare the previous weekend, Bomarsund responded by beating the same opposition in a T20 contest just three days later. But on Saturday it was not their day, with Thornton adding: “It was just disappointing that we couldn’t defend 224. Adam McTaggart departed for 12 before Thornton and Thain put together a stand which accelerated the total. The latter departed after being stumped by Graham Ord off the bowling of Andrew Lindsay before Gardner went for 19 as former Ashington all-rounder Sample had the 14-year-old caught behind. Sample struck again to remove John Haig Jr for 11, but Thornton continued to keep the innings afloat, helping himself to boundaries in the process. Sam Thornton departed in the final over having being caught out of his crease, Ord stumped him for three to hand Chris Dunn his first wicket of the innings. In their reply, Whitley began their innings with intent, and after Mark Harris and Pearson got their stand up-and-running, the former departed after Dan Robinson trapped him in front leg-before. John Douglas was bowled by Gary Mordey before Pearson and Sample began to turn the screw, taking control of the game. Adam Gardner found Pearson’s edge to give Andrew Matthews a catch behind the stumps, before he bowled Dunn for just six, but by this stage it was too little too late. Thornton added: “Adam [Gardner] bowled steady, he bowled a good first spell. Gary Mordey bowled very well and he has been our stand-out bowler so far this year. “I just don’t think that we put the ball in the right areas to keep the runs down. To be fair, Adam’s first spell only went for 18 off the six overs. Sample wrapped up the inning, as he closed out unbeaten on 68, and the firsts suffered their second defeat. On Saturday Bomarsund host high-fliers Cramlington, who are unbeaten so far this season.